I have not done my ‘Magical Product’ series for a while. Simply because now most of my time is dedicated to my 6 week old daughter, personal beauty routine activities have been reduced by 97%. Okay, just kidding: by 80%. Still, I want to look presentable. 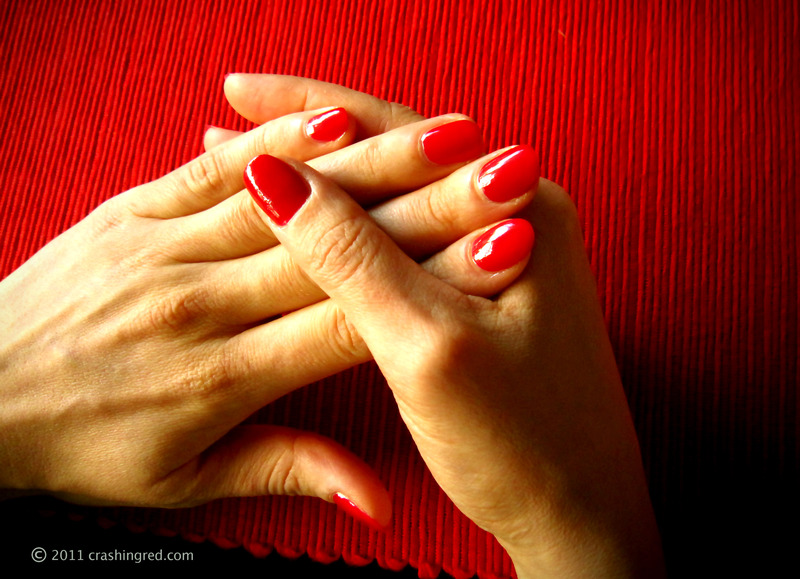 Therefore the importance of well groomed hands and nails is paramount. 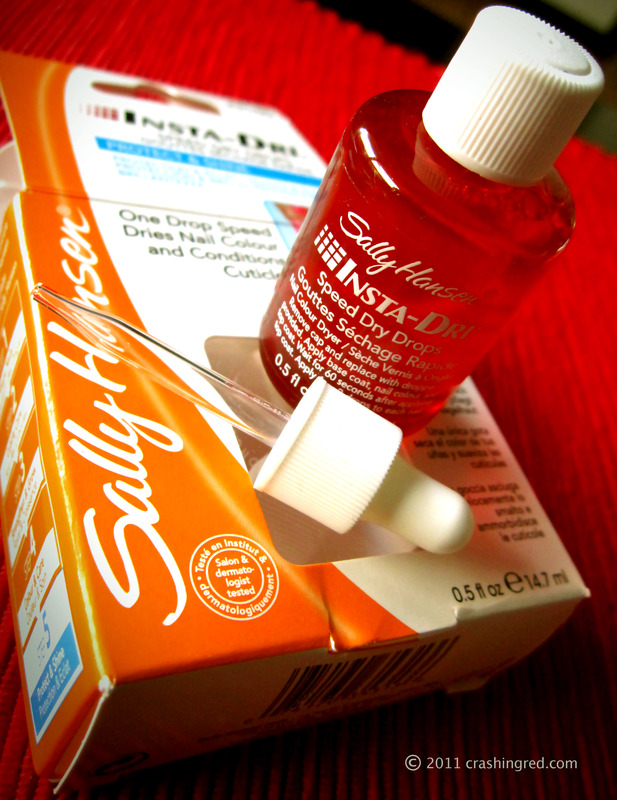 Looking for a way to speed up the manicure process and in particular, make nail polish dry faster, I have decided to test drive Sally Hansen’s Speed Dry Drops. Here is my review on this potentially magical product. Yes, the wonder Drops made my nail polish dry faster and with “a smooth hard finish”. First image demonstrates my glossy all dried up nails. Because I always wear at least 3 coats (protective base + nail enamel) it normally takes up to 20 minutes to dry, whereas with the Drops it took only 6 minutes. That is a great result. Easy to apply. Basically, just use the applicator provided to apply 1-2 drops on each nail. So not much concentration required to complete this action. The main trick is to get the bottle opened and the applicator extracted with freshly painted nails. So please learn from my mistakes, prepare all ‘tools’ before starting on your nails. Conditioned cuticles? I personally have not noticed any significant changes as seriously my cuticles look fine, they are moisturised on a daily basis. Another trick to speed up the nail polish drying process is to use ice cold water! Put enough water to cover your fingernails in a small bowl and add a few ice cubes to lower the temperature. Sink your hands into the water for at least 3 minutes. [Disclaimer] I was not paid for or asked to do this review. It exists purely from my own desire to spread the news about exceptionally effective products. Oh my goodness I so needed this review so badly!!! Girl my nails are not always so manicure because everytime I’m doing my nails my son decides is time for him and I to have our play time and they just become a hot mess!!! I need a miracle drier and it sounds like this is exactly what I been looking for.! Thx again girl. Love your review! And…I’ve never heard of the ice cold method but def going to try it during my next polish sesh! This sounds great – will definitely give it a try! Hi dear, thanks for your sweet comment on my blog, your blog is lovely and I’m now a follower! Yes, they do have them at Priceline store. It is around $15 full price. Cheaper than OPI! Sweet! Nice to hear that it works! I love polishing my nails but hate the time I have to wait for them to dry ha! Should buy this product! I ALWAYS ruin my manicures by doing something when the polish isn’t dry. So this might help me. To be honest, I ruin my nails anyway, washing dishes is a deathwish for nail polish. Great review & thanks for visiting me…..from your newest follower! That tip of the ice cold water seems great to me! I’m going to try it for sure! so i have what i guess is the newer version of this . . . blue instead of red. when i’m done, is it okay to leave to dropper in or should i switch the caps back out?